The Betta Dance! A Male Plakat Showing His Colors. Bettas are the easiest fish to care for. But as our interest grows, we want to do more with them such as breeding and showing them. All this takes time and effort and a strong desire to care deeply about a fish that truly is peaceful all alone! Below, you will find information about foods, breeding and diseases..everything you need to know about growing your betta hobby! In Thailand, the fish has been raised in households since the Sukhothai Period, more than 700 years ago. Records from the reign of King Lithai of Sukhothai allude to fighting fish being reared for sport. In 1840, the King of Siam presented several of his prized fighting fish to a friend of Theodor Cantor, and he, in turn, gave them to Cantor, a doctor in the Bengal Medical Service. Although these fish were more colorful than their earlier counterparts, their predominant colors of olive green, black and red still left much to be desired. The fin lengths also varied from specimen to specimen. In 1849, Cantor published an article on the fighting fish he called Macropodus pugnax, var. It was not until 1909 that C. Tate Regan re-examined this and noted that pugnax was already a distinct species. Since the fish had no scientific name, Regan named it Betta splendens, according to Gene Wolfsheimer, author of Enjoy the Fighting Fish of Siam. Young Males Showing Off Their Might To Each Other! To fully understand their needs it is important to become familiar with their native habitat. Bettas originate in the shallow waters in Thailand (formerly called Siam, hence their name), Indonesia, Malaysia, Vietnam, and parts of China. They proliferate rice paddies, shallow ponds, and even slow moving streams. In nature Bettas exist almost exclusively on insects and insect larvae. They are built with an upturned mouth that is well suited to snatching any hapless insect that might fall into the water. Internally their digestive system is geared for meat, having a much shorter alimentary track than vegetarian fish. For this reason, live foods are the ideal diet for the betta, however they will adapt to eating flake foods and frozen and freeze dried foods. Creative Pairing-You never know what you'll get! Bettas have a fairly short lifespan, and are most successful as breeders when they under a year old (bettas in pet shops are usually at least six months old). They breed in bubblenests and do not require a large tank or special equipment. Most breeders find that a bare bottomed tank of roughly ten gallons works well, although smaller tanks are also suitable. Ideally the fish should be conditioned prior to breeding, by feeding them a diet of live foods. The water should be at a pH of about 7.0, and temperature around 80 or slightly above. The male will blow an elaborate bubble nest when he is ready to spawn. The female should be provided with a hiding place, as males may become aggressive during courtship. Even with a hiding place, it is common for the female to lose a few scales or have their fins frayed during spawning. When they are ready to spawn, the pair will display intense coloration and begin circling each other under the bubblenest. The male will wrap himself around the female who has turned on her back. As she expels the eggs, they are fertilized and begin to sink. The male will scoop up the eggs and spit them into the nest. From this point on the male will tend the brood. It is advisable to remove the female, as the male may become aggressive towards her as he tends his young. The male will continue to tend the bubblenest, spitting eggs that fall out back into the nest. In one to two days the eggs will hatch, and the fry will be visible hanging in the bubblenest with their tails pointing downward. They will feed off their yolk sack for another thirty six hours, during which time the male will continue to pick up any fry that fall out of the nest. 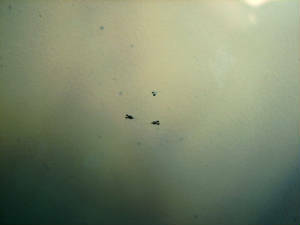 The male should be removed within two days after the fry hatch, as they may eat the young once they are free swimming. The fry should be fed a couple of feedings daily of baby brine shrimp or very fine baby food. Many breeders use vinegar eels and micro worms and now even, Banana worms for the first foods. Infusoria from the water and brackish waters also contain micro organisms suitable for the fry. Hikari Tropical makes a great dry first foods supplement specifically for egglaying fish, and many pet shops carry frozen baby brine shrimp. Take care not to overfeed, as the uneaten food will foul the water and can quickly prove lethal to the fry.We would like to also tell everyone that all of our breeding tanks and lights and plants and so on come from PET SUPPLIES "PLUS" Newington, Connecticut. (860) 688-2616 I encourage everyone to make the trip or if you are around the area, to stop in! They have, by far, the best prices and the most helpful and friendly staff we have ever met, all the items you might need and if they don't-They'll get it in for you in a very timely manner! So, thank you to Pet Supplies Plus and here's to continued business! Spawning Photos taken by ABS President-Jamie Lee. 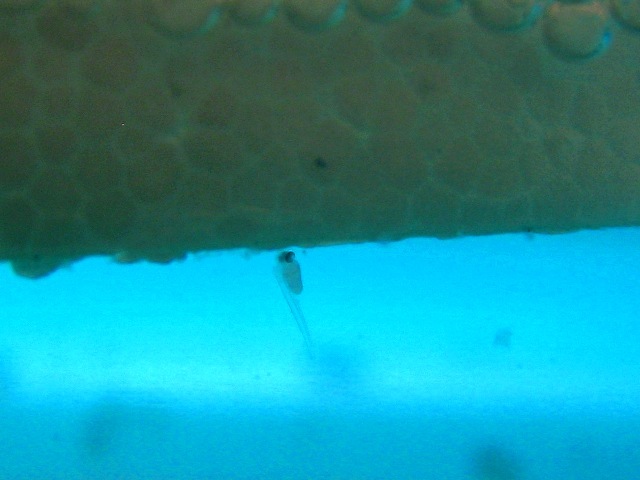 Newly Hatched Betta Fry Hanging On In The Bubbles! ...One week old: 0.2 inches long. Four weeks old: 0.45 inches long on average. Five weeks old: 0.6 inches long. Size ranges from .5 to .75 inches. Six weeks old: 0.85 inches long. The largest are over an inch. Seven weeks old: 1.1 inches long. Eight weeks old: 1.3 inches long. Nine weeks old: 1.55 inches long. *This fantastic betta growth chart was created by Wayne Schmidt. This is the best chart or graph we have seen and we wanted to make sure everyone shared in his great work! 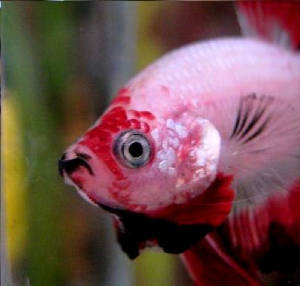 For a link to Waynes website with more betta information, go to our Betta Links page! Remember that bettas are not big eaters and it is very easy to overfeed. Since fish have to eat and produce waste as a result of eating, water changes are a must, and there is no exception when it comes to bettas. In fact, since a lot of bettas are kept in small containers that don't have some sort of filtration, water changes are even more important and need to be done every 2 or 3 days to prevent toxic build up. When doing water changes it is very important to move any uneaten food or waste that may have settled to the bottom, and to replace about 80 percent of the water. While adding fresh water one can't forget to add a good tap water conditioner that removes chlorine, breaks the chloramine bond, and one that detoxifies heavy metals. Not adding a tap water conditioner could result in disaster. Males must not be kept together, otherwise they will fight - sometimes to the death. Females can be kept together, but can be territorial. This is often a difficult fish to mix in a community tank. Many fish will nip on the long flowing fins, even some species which do not usually fin-nip. 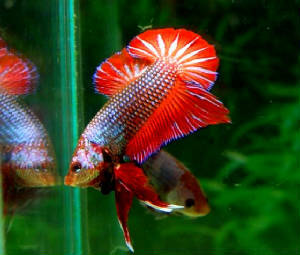 On the other hand, some bettas can be aggressive to fish they see as rivals (such as male guppies with their fancy tails). *Information gathered from various sources and the experiences of other breeders. Your experience may vary and be quite different. This information is to be used soley as a reference to help get you started! Good Luck! Have you joined the IBC? 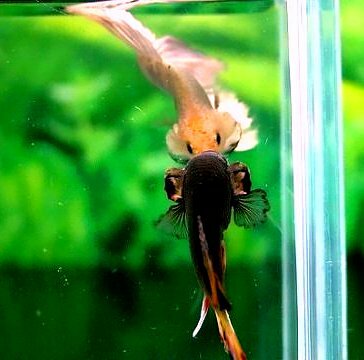 Best resource for bettas in the world! Or Join The AstralBetta Society!